﻿ Champions League semi-finals: The calm before the storm! 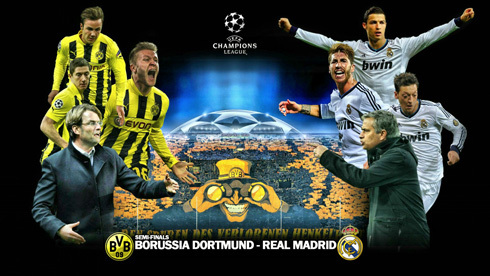 22.04.2013 » Champions League semi-finals: The calm before the storm! The road to the Champions League final is always a tough journey regardless of the season in question. Club-wise, this competition has always been the pinnacle of European football and there's simply no other trophy that a player could aspire winning more than this one. 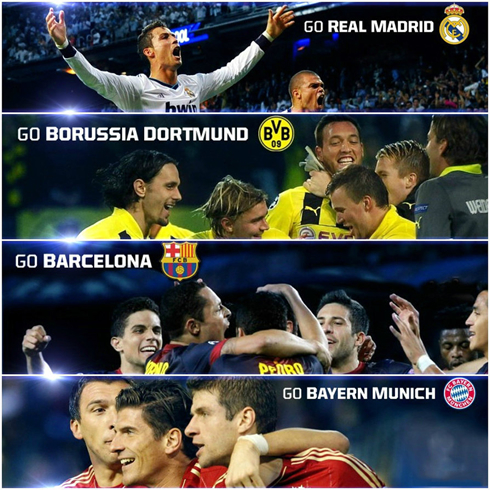 Real Madrid, Borussia Dortmund, Barcelona and Bayern Munich will battle for the ultimate glory over the next weeks. You can all expect fireworks and breath-taking games for the upcoming Champions League semi-finals, as no team is ready to give up on the dream of becoming European champion and everyone is likely to come out guns blazing. The draw dictated a nations clash between Spain and Germany but unlike last year, it seems quite hard to point out who the favorites are. Nevertheless, last season both Real Madrid and Barça were given the edge by most football pundits out there and they ended up losing their chance to be on the final at the hands of Bayern Munich and Chelsea. Uncertainty will most likely be a keyword that will fit perfectly in going along with these two-leg semi-finals preview headline. 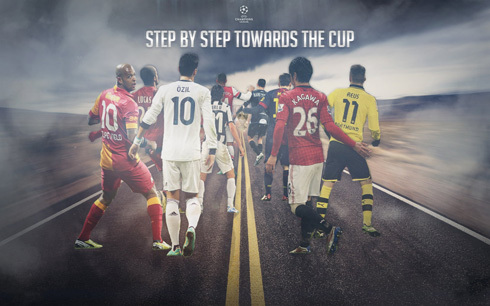 Real Madrid seek their much-awaited 10th UEFA Champions League in the club's history and they count on Cristiano Ronaldo to lead the way to the Wembley final. The team appears to finally be solid defensively, with Diego López pulling off brilliant performances one after another and a 19-years old Raphael Varane establishing himself as a world-class center defender. At this point of the season and given the circumstances, the "Casillas debate" only makes sense to be brought to the surface by those who have an hidden agenda of somehow attempting to disturb José Mourinho and force his way out of Madrid next season. Midfield might have suffered a small upset with Luka Modric getting injured on this last Saturday game against Betis. However, if everything goes according to what is probably already planned, Mourinho should go with Xabi Alonso, Sami Khedira and Mesut Ozil on the line-up and the Croatian's absence might end up not being much noted, at least throughout the first hour of the game. The problem might arise in those last 30 minutes though, when the need for some fresh legs emerges and Mourinho sees himself forced to resort to players such as Essien or Kaká. It's not as if they are bad players, but they may very well come up short to the manager's expectations for a dynamic midfielder role, especially in such a demanding game as it will be this one against Borussia Dortmund. At the other side of the "trench" will be last season Bundesliga's winners, Borussia Dortmund. This Jurgen Klopp side has grown and developed immensely over the past few years and despite having failed to give a good fight to Bayern Munich domestically this season, make no mistake about how good and talented this team really is. Real Madrid already had the fortune (or misfortune) to bump against them in the Champions League group stage back in October and November and to the surprise of only a few people, the Merengues couldn't manage to win any of those two games. The Germans have a well balanced team and even though we can't say they depend on any player in particular, two or three names still stand out from the pack: Mario Götze, Marco Reus and Robert Lewandowski. If Real Madrid has quite an hard task in hands, what can then be said about Barcelona's challenge against Bayern Munich? The Bavarian side is most likely the best in-form team in Europe right now, humilliating all their opponents week after week and are basically the only of these 4 semi-finalist teams who can still dream about winning the "triplete" (domestic league, domestic cup and Champions League). They already got rid of Juventus in the quarter-finals (4-0 on aggregate) in quite an emphatic way and there's surely nothing that would please more Bayern Munich fans than winning the 5th Champions League title in the club's history. As for Barcelona, bookies seem to still grant them a bit more chances of qualifying to the final, but everyone knows it will always come down to the Blaugrana's biggest star ever physical condition: Lionel Messi. If the Argentinian is indeed fully recovered from that hamstring injury suffered in Paris a few weeks ago and manages to display his best football against Bayern Munich, then we may very well see the new German champions in real trouble for the first time this season. Either way, we're surely up for two fantastic Champions League semi-finals tie and you'll be able to watch all this soccer live action with us, from our live streaming pages! 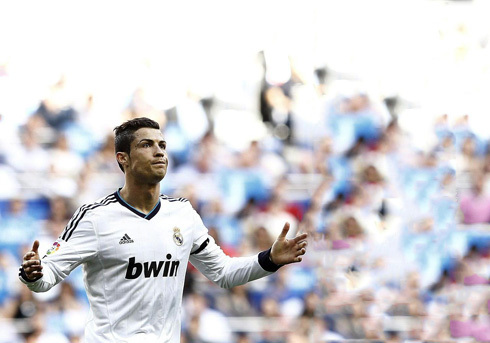 Cristiano Ronaldo next game for Real Madrid will be an always exciting match against Borussia Dortmund, for the Champions League semi-final 1st leg, on April 24, 2013. You can watch Juventus live stream, Borussia Dortmund vs Real Madrid, Bayern Munich vs PSG, Manchester United vs Aston Villa and Fenerbahçe vs Benfica, all matches provided from our soccer live streaming section.